Arrigoni P.V., 2007. Contributo alla conoscenza della flora della Sardegna: nuove specie di Taraxacum e altri reperti. Parlatorea, 9: 87-94. Carra A., Bambina M., Pasta S., Garfì G., Badalamenti O., Catalano C., Carimi F., Sajeva M., 2016. In-vitro regeneration of Calendula maritima Guss. (Asteraceae), a threatened plant endemic of Western Sicily. Pakistan Journal of Botany, 48 (2): 589-593. D’Angeri F. & NEMO s.r.l (eds. ), 2010. Piano di Gestione del sito "Natura 2000" Saline di Trapani e Marsala - POR Sicilia 2000/2006 - Codice Identificativo 1999.IT16.1PO.011/1.11/11.29/0297. 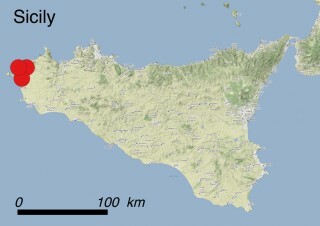 Trapani, Provincia Regionale di Trapani. Grammatico F., 2011. Aggiornamenti sulla distribuzione e status di conservazione di Calendula maritima Guss. (Asteracee). Il Naturalista siciliano, s. 4, 35 (1): 43-49. Pasta S., Garfì G., Carimi F., Marcenò C., 2017. Human disturbance, habitat degradation and niche shift: the case of the endangered endemic Calendula maritima Guss. (W Sicily, Italy). Rendiconti dell’Accademia nazionale dei Lincei, Classe di Scienze Fisiche, Matematiche e Naturali, DOI 10.1007/s12210-017-0611-5. Pérez M.P., Navas-Cortéz J.A., Pascual-Villalobos M.J., Castillo P., 2003. Nematicidal activity of essential oils and organic amendments from Asteraceae against root-knot nematodes. Plant Pathology, 52: 395-401. Plume O., Raimondo F.M., Troìa A., 2015. Hybridization and competition between the endangered sea marigold (Calendula maritima, Asteraceae) and a more common congener. Plant Biosystems, 149: 68-77. Troìa A., 2011. Strategie di gestione delle popolazioni di Calendula maritima Guss. (Asteraceae). Il Naturalista siciliano, s. 4, 35 (1): 51-63. Troìa A., Bazan G., Schicchi R., 2011. Nuove aree di rilevante interesse naturalistico nella Sicilia centro-occidentale: proposta di tutela. Il Naturalista siciliano, s. 4, 35 (2): 257-293. Troìa A., Greuter W., Raimondo F.M., 2012. Revised lectotypification of the name Calendula maritima (Asteraceae). Phytotaxa, 71: 48-51. Troìa A., Pasta S., 2006. Calendula maritima. The IUCN Red List of Threatened Species 2006. e.T61618A12524417 (http://dx.doi.org/10.2305/IUCN.UK.2006.RLTS.T61618A12524417.en). Troìa A., Raimondo F.M. (eds. ), 2011. Proceedings of the International Meeting “The Calendula of Trapani, an emblematic threatened Mediterranean endemic”, (Trapani, 20/02/2010). Il Naturalista siciliano, s. 4, 35 (1): 1-129. Endemic to Western Sicily, Calendula maritima thrives nowadays only in a few coastal sites between the Stagnone di Marsala lagoon and Trapani with less than 25 small, fragmented and often hybridized subpopulations. 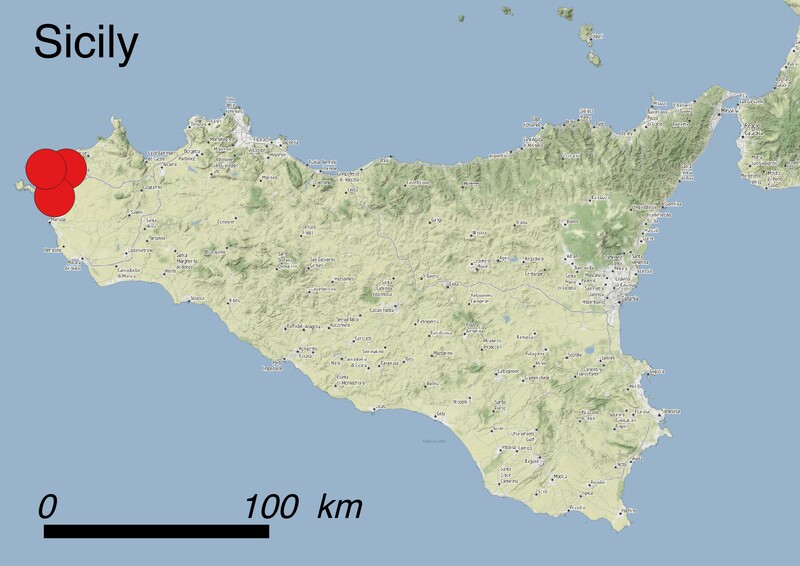 Small subpopulations also occur on four islets off the Sicilian coast: Isola Grande dello Stagnone, Maraòne, Formica and Colombaia, while it has disappeared from the island of Favignana and from the coasts near Mt. Cofano. Using a 2×2 km grid, C. maritima has an EOO of 73 km2 and an AOO of 36 km2. Although it has been argued that the sea marigold was linked to open nitrogen-rich sandy habitats (habitat 13.3: Coastal sand dunes), in fact it shows a high tolerance to anthropogenic disturbance and lives also on rocky coastal habitats (habitat 13.1: Sea cliffs and Rocky Offshore Islands) and within ruderal communities in urban areas (habitat 14.5: Urban areas). Previous records of C. maritima for Malta and Sardinia were proved to be misidentifications of other marigolds of the ‘C. suffruticosa’ group. This herbaceous plant is 20-40 cm tall and can be woody at the base. Its stems and leaves are covered with short, sticky hairs. The young stems are upright, later branching and drooping to the ground. Unlike the common ornamental and medicinal plant Calendula officinalis, this species has fleshy leaves with a very strong scent. The leaf blade varies from ovate to linear, depending on the position on the stem. This species resembles a little daisy with yellow flowers 3-5 cm in diameter. The main flowering period is April to June, but some flowers can be found throughout the year and even during winter under particularly mild conditions. This plant is a perennial, but most individuals (possibly due to drought stress) have an annual life cycle. In this case they die back after flowering and seed setting. The seeds then germinate around October-November. Summer drought induces the end of flowering season more than winter cold. Recent field investigations allowed to confirm the extinction of C. maritima in many localities, but also to find several new subpopulations along the coastline of Trapani and its neighbouring municipalities. As a matter of fact, the species often behaves like a pioneer species and metapopulation dynamics seem to be still intense. Other species belonging to the genus Calendula are grown worldwide as ornamental plants in private and public gardens under temperate and Mediterranean climatic conditions. This species has the potential to be developed for horticulture as well. Recent studies point out that C. maritima is promising also for pharmaceutical and agronomic purposes. Many other perennial marigolds grow along the coasts of NW Africa and the Southern Iberian Peninsula (Algarve and Andalusia). Like C. maritima, they have been treated as species or as subspecies of C. suffruticosa Vahl or of C. incana Willd. According to the Guidelines for Using the IUCN Red List Categories and Criteria, based on EOO (73 km2) and AOO (36 km2, grid 2×2 km), as well as on fragmentation and decline patterns, this species has been categorized CR (Critically Endangered) according to criterion B1ab(i, ii, iii, iv). The main threats are related to the conservation of its natural habitat that is prone to ongoing destruction, degradation and fragmentation. More in detail, on the main island the species is subject to increasing pressure due to several anthropogenic disturbance factors (threats 1.1: Housing and urban areas, 1.2: Commercial and industrial areas, 1.3: Tourism and recreation areas, and 9.4: Garbage & solid waste). Additionally, many populations are rather unsteady, very small and severely threatened with competition due to alien plants such as Carpobrotus spp. (threat 8.1.2: Invasive non-native/alien species - Named species), and with ongoing hybridization with the congener Calendula fulgida (threat 8.2.2: Problematic native species/diseases - Named species). Moreover, as many populations grow in areas concerned by strong human impact for seasonal recreational purposes (threat 6.1: Recreation activities) and the flowers are often collected due to their attractiveness (threat 5.2.1: Gathering terrestrial plants - Intentional use), the reproductive success of several populations is also at risk. Legally: No measures have been taken to protect the species itself. 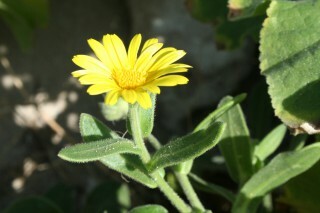 In 2010, the Province of Trapani promoted an international meeting to highlight the importance of the species, but it was never declared the official symbol of the Province (as indicated on http://www.iucnredlist.org/sotdfiles/calendula-maritima.pdf). Most of C. maritima populations are located within the Natura 2000 sites ITA010001 “Isole dello Stagnone di Marsala”, ITA010007 “Saline di Trapani”, ITA010027 “Arcipelago delle Egadi. Area marina e terrestre” and ITA010028 “Stagnone di Marsala e Saline di Trapani. Area marina e terrestre”. Furthermore, some of them are located within the Nature Reserves “Saline di Trapani e Paceco” and “Isole dello Stagnone di Marsala” and within the Marine Protected Area of the “Egadi Islands”. Here no new roads or buildings may be built without permission, and it is forbidden to collect seeds, flowers or any vegetative parts of the plants. These areas are well managed, and are subject to regular scientific monitoring. In situ: Some of the subpopulations thriving in the Nature Reserve “Saline di Trapani e Paceco” were threatened by the construction site of the adjacent harbor of Trapani, modified in order to host some parts of the 2005 edition of America’s Cup yacht competition. The plants of C. maritima remained completely untouched thanks to a long negotiation between environmentalist NGOs, the Regional and National authorities and the companies involved in the construction site. In the framework of a project promoted by the Klorane Foundation (with the involvement of the IUCN Mediterranean Islands Plant Specialist Group: http://www.institut-klorane.org/proteger-le-patrimoine-vegetal) ca. one hundred seedlings were planted by school children within the “Saline di Trapani and Paceco” Nature Reserve. Many of them lived enough to produce offspring, thus reinforcing the local population. An ad hoc project LIFE15 NAT/IT/000914 entitled “CalMarSi Life - Measures of integrated conservation of Calendula maritima Guss., a rare endangered species of the Sicilian vascular flora” started in November 2016. Ex situ: seeds of several subpopulations were gathered within the GENMEDOC project (an inter-regional network of Mediterranean seed banks). More recently other seeds from almost all populations were collected within the Project “Calendula” funded by the Klorane Foundation and were stored at the seed banks of several institutions such as the Institute of Biosciences and BioResources of the National Council of Research of Palermo, the Conservatoire National Botanique of Brest (France) and the Department STeBiCeF of the University of Palermo. Although seeds show a high germination rate under cultivation, it is not easy to find suitable places to replant the seedlings due to coastal habitat destruction and disturbance. The staff of the Institute of Biosciences and BioResources of the National Council of Research of Palermo recently designed an effective procedure in order to perform the in vitro propagation of Calendula maritima. This species should be added to Appendix I of the Bern Convention and Annexes II and IV of the 92/43 EC ‘Habitats’ Directive to strengthen protection measures. A campaign to eradicate the invasive nuclei of Carpobrotus spp. in the sites where C. maritima lives needs to be initiated. The populations of Calendula maritima located outside nature reserves should be better protected, by limiting access to the sites and through a careful planning of any new road and building construction. Regular and frequent field surveys need to be made in order to monitor the demographic trends of each population and the outcome of the ongoing hybridization process with C. fulgida. Several initiatives aiming at increasing public awareness on the importance and rarity of this plant have been done and need to be continued. Dr. Salvatore Pasta, Department of Biology, University of Fribourg, Switzerland. Dr. Angelo Troìa, Dipartimento STEBICEF, sezione di Botanica ed Ecologia Vegetale, Università degli Studi di Palermo, Palermo, Italy. Dr. Giuseppe Garfì, Institute of Biosciences and BioResources of the National Council of Research, Unit of Palermo, Italy. Dr. Leonardo Scuderi, free-lance botanist, Trapani, Italy.